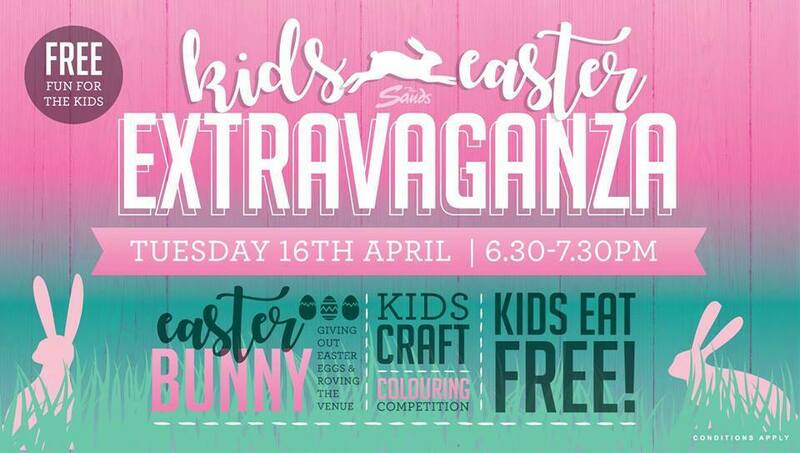 The Sands Carrum Downs is getting into the Easter spirit with a huge kids Easter Extravaganza night! On Tuesday the 16th of April, The Sands Carrum Downs will be hosting a special Easter night perfect for families and kids to unwind and enjoy a range of Easter activities and entertainment. The Easter Bunny will be visiting the Sands from 6:30pm - 7:30pm, handing out Easter Eggs and meeting the children. There will be craft activities a plenty with a colouring competition happening throughout the night. Kids eat free on Tuesday night's at The Sands, making it an even better night out for families on a budget! There are also two playgrounds open in The Sands - an indoor and outdoor - so kids will always be entertained. Bookings are essential to secure your table as it is expected to be a busy night!